As much as I love food, there are few dishes I can eat repeatedly without some type of consumption fatigue. That said, for every rule there is always an exception and for me, it is noodles. Whether it is Italian pasta, Vietnamese pho, Malaysian laksa or Japanese udon, I can never pass up a good bowl of the stuff. 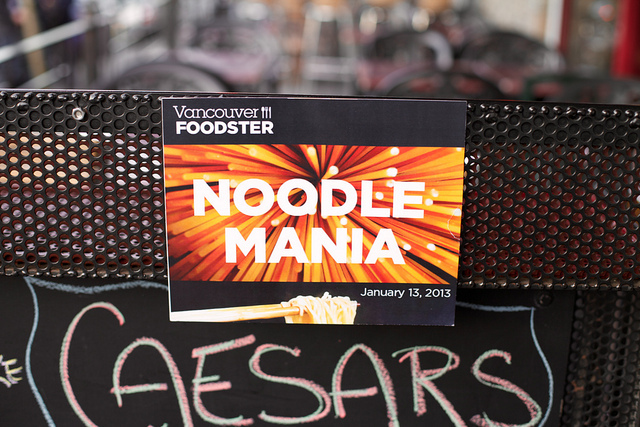 On Jan 13th, Richard Wolak from Vancouver Foodster hosted the first ever Noodle Mania event here in Vancouver. Along with the great Sherman Chan from Sherman’s Food Adventures and Sean Neild from Sean’s Adventures In Flavor Town, I swung by all ten venues for what turned out to be a really fun epicurean adventure! The first stop of the day was Shaktea on Main Street to pick up our media passes. My first time at this cosy tea store was at the end of June last year during the Tasting Plates Summer 2012 tour. 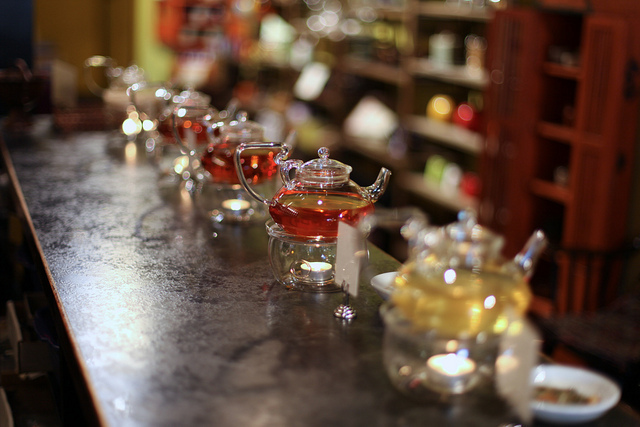 The staff is always super friendly and knowledgeable about all things tea which makes this a very comfortable and familiar stop for regulars and new patrons alike. As Shaktea was getting quite packed, Sherman, Sean and I quickly made our way to our first food stop: Hai Phong on Kingsway. With so many great pho joints in the GVRD, I was not surprised I had never been to this one. Sean went with the Beef Noodle Soup so I went with the Crab Paste Noodle Soup. 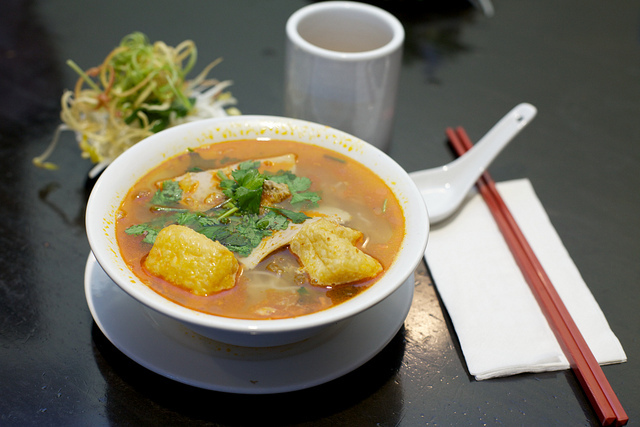 I found the broth very clean and flavourful without any overpowering artificial aftertaste. 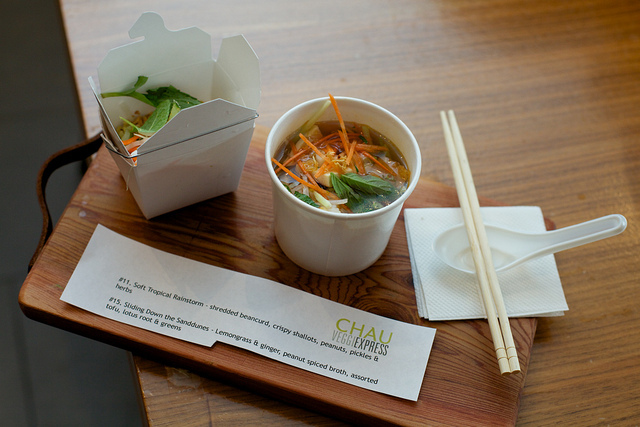 With our tummies full of delicious pho, we were off to our next stop: CHAU Veggie Express on Victoria Drive. Served on a neat wood paddle tray were two very creatively named dishes: a cold noodle called Soft Tropical Rainstorm and a broth based noodle dish served hot called Sliding Down the Sand Dunes. The hot broth was welcome on a nippy afternoon while the cold noodle dish was appreciatively refreshing. I was a bit surprised to see Fets added to the Noodle Mania tour as it has always been more of a bar/grill to me but I really did enjoy their pasta offering. 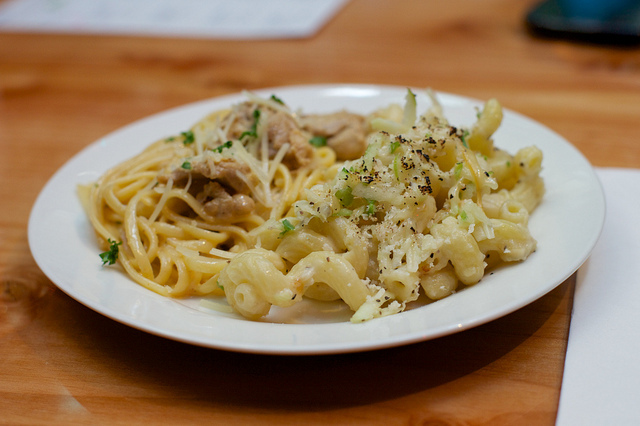 The Mac’n Cheese was gooey and delicious but the Cajun Cream Linguini was definitely my favorite of the two. The sauce for the linguini had a punch of heat to it that I really liked and would definitely order again. Leaving Commercial Drive, Sherman drove us downtown to hit the two Yaletown stops. First up was the Urban Thai Bistro on Hamilton Street. 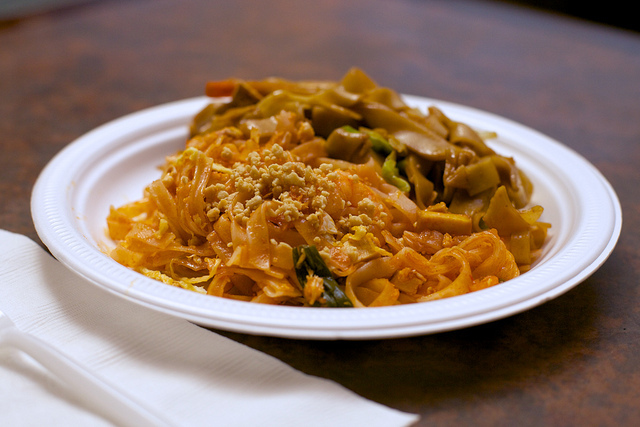 Now I normally like Pad Thai and Pad See-Ew but only when they are prepared fresh. Due to the large number of Noodle Mania patrons, this restaurant chose to make huge batches of the noodles and serve them buffet style. Suffice it to say, I do not believe the quality of food was indicative of this Thai bistro’s normal output so will have make a return visit. Walking one block down, we stopped by Yaletown L’Antipasto which turned out to be my favourite venue of the whole event. 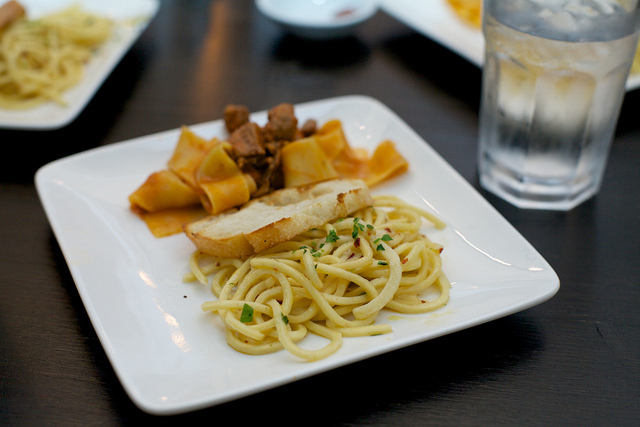 On the tasting menu were small portions of Pappardelle Rosse and Spaghetti in Pinot Grigio. This was my first time at this tiny Italian restaurant but I was quite impressed with the authenticity of the pasta and overall taste. The spaghetti was a bit too firm for my liking but I loved the rich meatiness of the Pappardelle Rosse. Leaving Yaletown for the Cambie Corridor, we stopped by the Soho Tea Room just as the final rays of daylight were fading. The restaurant was almost packed when we arrived and as we were leaving, a line had already formed of those waiting for a table. Unfortunately this venue seemed a little overwhelmed by the influx of patrons and we had to wait almost 45 minutes for our noodles. My lobster broth with rice noodles was lukewarm and the lone fish ball was cold. I do not believe Sean was that impressed with his satay rice noodles either. I will definitely need to return to this restaurant during regular hours as I would hope the food is normally not so sub par. As we were already in the Cambie area, we took a short drive over to Fairview for our next two stops. 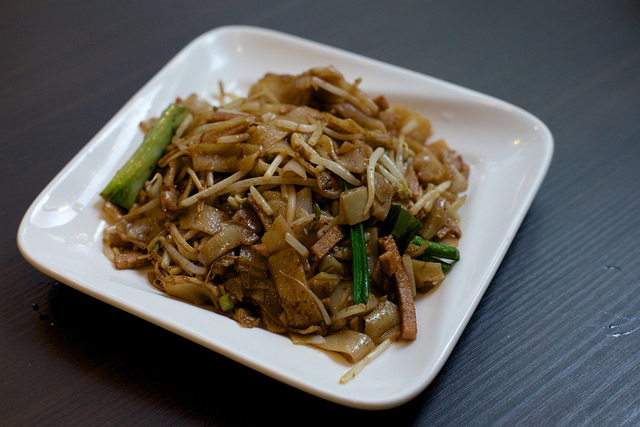 Right at Granville and West Broadway was the ever popular Bob Likes Thai Food. The funny name aside, the food really was quite good. I liked the Pad Thai and the fish curry was pretty decent as well. 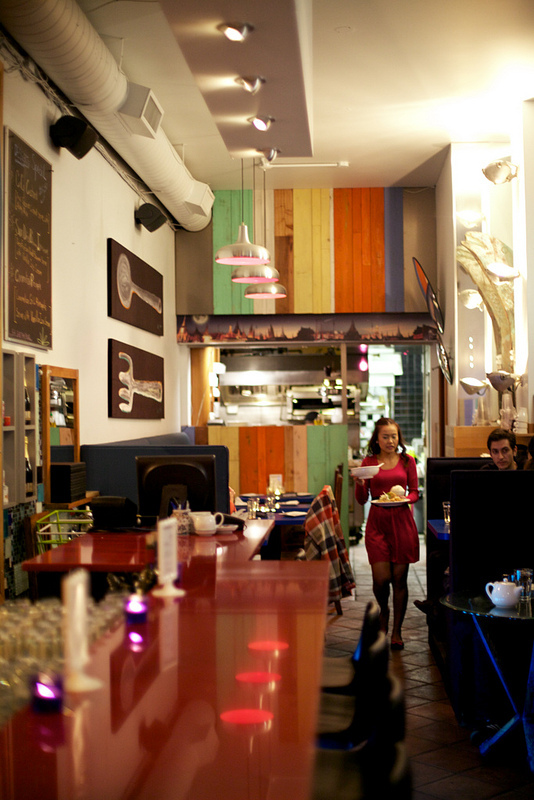 A short drive over to Burrard Street took us to the spacious Novo Pizzeria and Wine Bar. As our second last stop, we were quite full at this point in the evening but managed to soldier on. 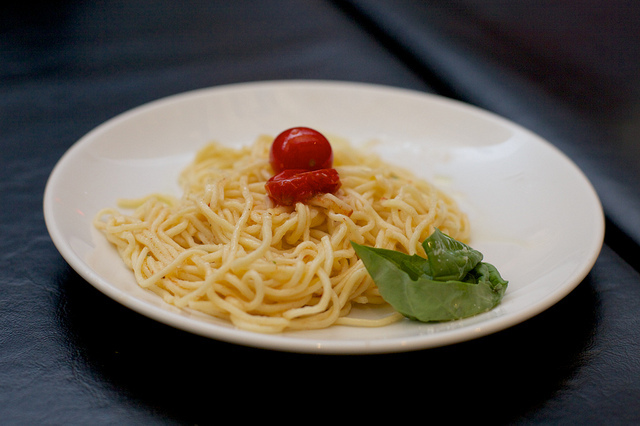 The spaghetti campana was cooked nicely but a little bland for me. I learned this was a brand new dish that Novo was experimenting with so there was room for improvement. Personally, the dish was a bit simple for me and lacked depth of flavour. 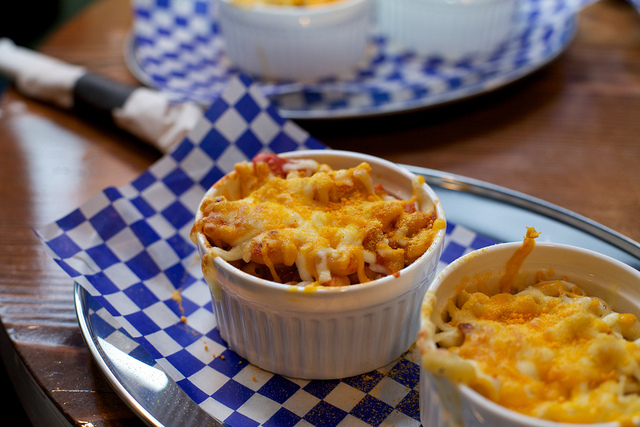 Our tenth and final venue of the event was The Mac Shack all the way up in Kerrisdale Town. I had been to the Mac Shack when it opened and a second time for a media tasting so this Noodle Mania stop was my third visit in all. To be honest I was so full at this point I could barely taste the two different mac n cheese offerings. Ten venues is definitely a lot for 4-5 hours and I have learned to pace myself better at future events of this nature. A big thank you to Sean Neild and Sherman Chan for the fantastic company and of course Richard Wolak for the kind invite. If any of the restaurants above interest you, definitely go check them out and let us know what you think. *Check out the rest of Alvin’s Noodle Mania 2013 photos in his flickr gallery here.